Adapted from the February 2019 Supplement to Otolaryngology–Head and Neck Surgery. Read the guideline at www.otojournal.org. “Tonsillectomy with or without adenoidectomy is one of the most common surgical procedures performed on children in the United States. The principal indications are obstructive sleep disordered breathing (oSDB) and recurrent sore throats. Since the guideline’s publication in 2011, there has been a large number of new studies published on tonsillectomy, including randomized-controlled trials and several meta-analyses. This makes an update important and timely,” said Ron B. Mitchell, MD, who chaired the 2019 guideline update, with Sanford M. Archer, MD, serving as assistant chair, Stacey L. Ishman, MD, MPH, as the methodologist, and Richard M. Rosenfeld, MD, MPH, MBA, as consultant. The purpose of this multidisciplinary guideline is to identify quality improvement opportunities in managing children under consideration for tonsillectomy and to create explicit and actionable recommendations to implement these opportunities in clinical practice. Specifically, the goals are to educate clinicians, patients, and/or caregivers regarding the indications for tonsillectomy and the natural history of recurrent throat infections. 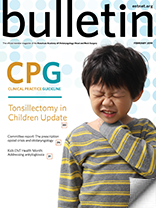 “This update seeks to optimize the perioperative management of children undergoing tonsillectomy, emphasizing the findings of new published studies, improving counseling and education of families of children who are considering tonsillectomy for their child, highlighting the management options for patients with modifying factors, and reducing inappropriate or unnecessary variations in care,” said Dr. Mitchell. A draft of the original Tonsillectomy in Children Clinical Practice Guideline was sent to a panel of expert reviewers from the fields of nursing, infectious disease, consumers, family medicine, anesthesiology, sleep medicine, pediatrics, and otolaryngology-head and neck surgery. 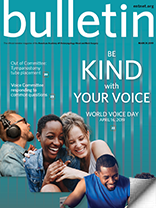 The reviewers concluded that the original guideline action statements remained valid but should be updated with major modifications, including the development of new key action statements. Changes from the prior guideline include two consumer advocates added to the update group; evidence from one new clinical practice guideline, 26 new systematic reviews, and 13 new randomized controlled trials; enhanced emphasis on patient education and shared decision-making; the addition of an algorithm to clarify action statement relationships; changes to five of the key action statements (KASs) from the original guideline; incorporation of new evidence profiles to include the role of patient preferences, confidence in the evidence, differences of opinion, quality improvement opportunities, and any exclusion to which the action statement does not apply; and the addition of seven new KASs. Clinicians should recommend watchful waiting for recurrent throat infection if there have been fewer than seven episodes in the past year, fewer than five episodes per year in the past two years, or fewer than three episodes per year in the past three years. Clinicians may recommend tonsillectomy for recurrent throat infection with a frequency of at least seven episodes in the past year, at least five episodes per year for two years, or at least three episodes per year for three years with documentation in the medical record for each episode of sore throat and one or more of the following: Temperature greater than 38.3C or 101.F, cervical adenopathy, tonsillar exudate, or positive test for group A beta- hemolytic streptococcus. Clinicians should assess the child with recurrent throat infection who does not meet criteria in KAS2 for modifying factors that may nonetheless favor tonsillectomy, which may include but are not limited to: multiple antibiotic allergies/intolerance, PFAPA (periodic fever, aphthous stomatitis, pharyngitis, and adenitis), or history of more than one peritonsillar abscess. Clinicians should ask caregivers of children with obstructive sleep-disordered breathing (oSDB) and tonsillar hypertrophy about comorbid conditions that may improve after tonsillectomy, including growth retardation, poor school performance, enuresis, asthma, and behavioral problems. Before performing tonsillectomy, the clinician should refer children with oSDB for polysomnography (PSG) if they are under two years of age or if they exhibit any of the following: obesity, Down syndrome, craniofacial abnormalities, neuromuscular disorders, sickle cell disease, or mucopolysaccharidoses. The clinician should advocate for PSG prior to tonsillectomy for oSDB in children without any of the comorbidities listed in KAS5 for whom the need for tonsillectomy is uncertain or when there is discordance between the physician examination and the reported severity of oSDB. Clinicians should recommend tonsillectomy for children with obstructive sleep apnea (OSA) documented by overnight PSG. Clinicians should counsel patients and caregivers and explain that oSDB may persist or recur after tonsillectomy and may require further management. The clinician should counsel patients and caregivers regarding the importance of managing posttonsillectomy pain as part of the perioperative education process and should reinforce this counseling at the time of surgery with reminders about the need to anticipate, reassess, and adequately treat pain after surgery. Clinicians should not administer or prescribe perioperative antibiotics to children undergoing tonsillectomy. Clinicals should administer a single, intraoperative dose of intravenous dexamethasone to children undergoing tonsillectomy. Clinicians should arrange for overnight, inpatient monitoring of children after tonsillectomy if they are under the age of three years old or have severe obstructive sleep apnea (OSA); apnea-hypopnea index [AHI] of 10 or more obstructive events/hour, oxygen saturation nadir less than 80 percent, or both). Clinicians should recommend ibuprofen, acetaminophen, or both for pain control after tonsillectomy. Clinicians must not administer or prescribe codeine, or any medication containing codeine, after tonsillectomy in children younger than 12 years. Clinicians should follow up with patients and/or caregivers after tonsillectomy and document in the medical record the presence or absence of bleeding within 24 hours of surgery (primary bleeding) and bleeding occurring later than 24 hours after surgery (secondary bleeding). Clinicians should determine their rate of primary and secondary posttonsillectomy bleeding at least annually. The target patient population for the guideline is any child 1 to 18 years of age who may be a candidate for tonsillectomy. The guideline does not apply to populations of children excluded from most tonsillectomy research studies, including those with neuromuscular disease, diabetes mellitus, chronic cardiopulmonary disease, congenital anomalies of the head and neck region, coagulopathies, or immunodeficiency. This guideline is intended for all clinicians in any setting who interact with children who may be candidates for tonsillectomy. 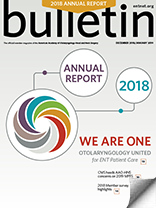 The full guideline, as well as other resources, are available at https://www.entnet.org/tonsillectomyCPG and in Otolaryngology–Head and Neck Surgery as published at www.otojournal.org. 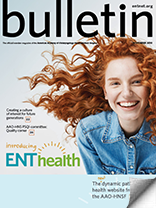 ENThealth.org includes patient-focused information on the topic of tonsillectomy in children that incorporates the key action statements of the update to this guideline. The guideline is endorsed to date by American Academy of Family Physicians (AAFP), American Academy of Sleep Medicine (AASM), The American Society of Pediatric Otolaryngology (ASPO), Infectious Diseases Society of America (IDSA), Society of Anesthesia and Sleep Medicine (SASM), The Society of Otorhinolaryngology and Head-Neck Nurses (SOHN), The Society for Pediatric Anesthesia (SPA), and The Triological Society. The American Society of Anesthesiologists’ (ASA) Administrative Council has approved endorsement. Since the document has neither been presented to nor approved by either the ASA Board of Directors or House of Delegates, it is not an official or approved statement or policy of the Society. This clinical practice guideline is not intended as an exhaustive source of guidance for managing tonsillectomy in children. Rather, it is designed to assist clinicians by providing an evidence-based framework for decision-making strategies. The guideline is not intended to replace clinical judgment or establish a protocol for all individuals with this condition and may not provide the only appropriate approach to diagnosing and managing this program of care. As medical knowledge expands and technology advances, clinical indicators and guidelines are promoted as conditional and provisional proposals of what is recommended under specific conditions, but are not absolute. Guidelines are not mandates. These do not and should not purport to be a legal standard of care. The responsible physician, in light of all circumstances presented by the individual patient, must determine the appropriate treatment. Adherence to these guidelines will not ensure successful patient outcomes in every situation. The AAO-HNSF emphasizes that these clinical guidelines should not be deemed to include all proper treatment decisions or methods of care, or to exclude other treatment decisions or methods of care reasonably directed to obtaining the same results.